This wide changing tray fit perfectly on the DaVinci Kalani six drawer dresser. Convert your dresser into a convenient changing table with the Universal Wide Removable Changing Tray. The changing tray comes with 2 additional smaller compartments that can keep baby changing necessities close at hand. Dimensions 44.75 In. X 18.75 In. X 2.75 In. Great changing tray that fits perfectly on my Davinci dresser. The tray comes with a mounting system that attaches securely in seconds. The two compartments are also nice for various baby changing odds and ends. Great purchase. Great product! 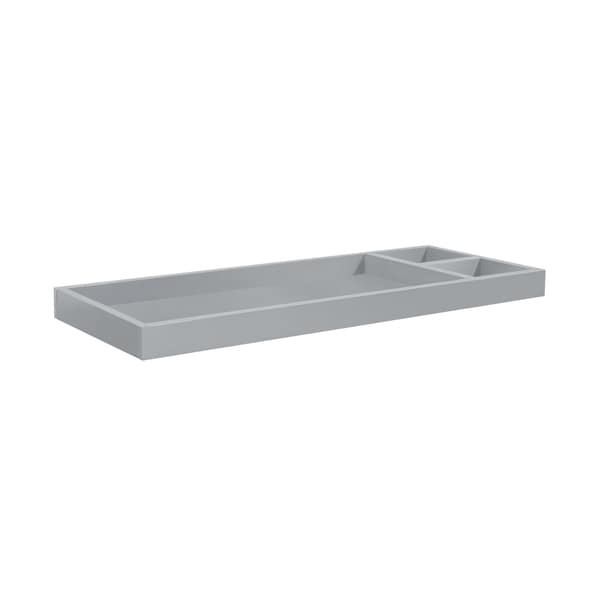 I really wanted to order a dresser that had a removable changing tray so it would be useful throughout the years. I ordered this to pair with the DaVinci Signature 6 Drawer Dresser and it fit perfectly. Very easy to secure on dresser; took all of 5 minutes. I love the tray can easily be removed to accommodate a mirror in the future. Great product! This was so easy to install and the quality of construction seems great so far. It takes up the entire top of the Davinci dresser except for about 1.5 inches on each side. There is a large compartment where the baby will lay and two smaller ones for what ever else you would like to store. We are having twins and needed decent furniture for the twins at a reasonable price. This topper was part of the collection and fits very well On the top of the dresser. The twins aren’t here yet so I can’t comment to how it will hold up. The color is a nice dark chocolate. Beautiful once in place and very easy to attach asits already assembled. "will this fit on top of this delta dresser? https://www.overstock.com/Home-Garden/Delta-Children-3-drawer-Dresser/12369089/product.html?recset=1fa62110-253a-44b8-ab16-0ad4ad73f62f&refccid=55XWTRZZVARIC3KMWSA7T2ZGGM&searchidx=2&recalg=63&recidx=2"
It matched a dresser we had purchased and Overstocks was one of the few places I could find it.